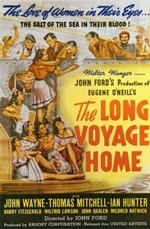 The Long Voyage Home is a 1940 American drama film directed by John Ford. It features John Wayne, Thomas Mitchell, Ian Hunter, Barry Fitzgerald, Wilfrid Lawson, John Qualen, Mildred Natwick, and Ward Bond, among others. The film was adapted by Dudley Nichols from the plays The Moon of the Caribbees, In the Zone, Bound East for Cardiff, and The Long Voyage Home by Eugene O'Neill. The original plays by Eugene O'Neill were written around the time of World War I and were among his earliest plays. Ford set the story for the motion picture, however, during the early days of World War II. The staff at Variety magazine wrote, "Combining dramatic content of four Eugene O'Neill one-act plays, John Ford pilots adventures of a tramp steamer from the West Indies to an American port, and then across the Atlantic with cargo of high explosives. Picture is typically Fordian, his direction accentuating characterizations and adventures of the voyage."